As possibly the most important wedding planning decision and usually the trickiest, choosing your wedding venue and ensuring you're aware of all that's involved is so very important. With hidden costs and clauses often at every turn, our Real Bride Lara knows it first hand. Today she shares all her wisdom and what she's learned along the way so you know exactly what to look for when booking your venue. "Choosing a venue was the first and one of the toughest decisions we made for our wedding. It can feel like a total minefield when you start looking, and when you've finally made a decision it is a massive (and nerve-wracking!) commitment. Now that it's less than a month to go until our big day, I can safely say that all the emails, scouring of brochures, mileage and estimates really paid off. If you've read my earlier posts you may remember me extolling the wonders of Huntsham Court, where we're having our big day. They're not paying me to write this (I promise!) but I seriously couldn't recommend having an "all-in-one" wedding enough. Sleeping, marrying, eating and partying in the same location has saved us hundreds, if not thousands, in extra transport, accommodation, and hire costs - not to mention hours of hassle! We don't need to worry about organising hotels for dozens of foreign relatives (not to mention ourselves) as well as coaches and fancy wedding cars to shuttle us between locations. Instead, all we have to do is simply turn up on Friday evening, have the best day ever on Saturday and make sure we drag ourselves out of bed in time on Sunday morning! We don't have to negotiate early access to finish any DIY decor or setting up the day before as we'll be there already, and we don't have to worry about remembering an overnight bag for the wedding night or the morning after... is doing the walk of shame in your wedding dress better or worse!? Of course this might not be what you want for your big day at all, but whether your dream is a traditional church wedding followed by a party in a teepee down the road, or being joined by your closest family and friends at the Town Hall before a reception at a city pub or hotel, there are a few essential factors that you must remember when taking the leap and finally choosing your venue. Good luck! Venues all seem to price their packages differently, which makes it hard to directly compare quotes. Fortunately one of the biggest and easiest charges to spot straight away is VAT. Is it included in their price? If not, that will be a hefty 20% on top of the costs they’ve sent you! Some venues also apply a separate service charge, either as a percentage of the total or per head, which can sneak up on you in the small print once you’ve already set your heart on that beautiful walled garden. And although this isn’t exactly a fee (which is why it can be easily overlooked!) don’t forget to find out what security deposit may be required and when. We all know weddings squeeze every single penny out of the piggy bank, so will you have enough in your budget to pay it on time? While you should hopefully get the full amount back, providing your guests don’t steal anything or trash the toilets, how long will it take them to return it? If there’s no guarantee in writing, you could be waiting for months - not ideal if you're going on honeymoon straight away! This wasn’t something that even occurred to us when we started looking at venues, but it soon became a deal-breaker. Yes, a venue might be a few hundred pounds cheaper but is it really a saving if you’re only allowed in a few hours before the wedding, or if you get kicked out at midnight along with all your décor and belongings? These sorts of logistics don’t normally feature on your planning radar until much closer to the day when you’ve already made what seems like hundreds of metres of bunting and lanterns, but they can really throw a spanner in the works when you realise you won’t have enough time to hang it all. When it comes to weddings, time can definitely be more valuable than money and you'll soon realise that having the flexibility to decorate on or before the big event, and to clear up the day after, is priceless. So when considering a venue, make sure you find out exactly what time you’ll have the space from and until. Even if you can’t get full access, will they let you drop anything off early and store it overnight after the wedding? I’ve heard of instances where couples haven’t realised they had to completely clear out the hall they'd hired by the end of the night or they would lose their deposit. Who wants to cut their party unexpectedly short by an hour to collect every little jam jar, chalkboard sign and piece of confetti before going to bed? No thanks! Certain venues can have lots of weird and wonderful restrictions, from no candles or confetti to what drinks you’re allowed to serve and even the footwear you and your guests can wear (yes, some venues forbid stilettos!). This all depends on the licenses they hold, the age and location of the building, and even just the preferences of the owners or management, but not knowing about them in advance (as with the access times) can cause a lot of unnecessary last-minute stress. Read the contract terms and conditions fully, and ask for clarification if you're not sure about anything. Are your photographers and videographers allowed to work everywhere, for example, or do they need to avoid certain areas, rooms or paintings? Churches in particular can be quite fussy about filming the ceremony, especially if you have a choir performing. Alcohol can be another tricky one. If you're organising your own bar, some venues only allow certain drinks with lower-alcohol content or no spirits at all - believe me, this happens! If your venue is no corkage but you want to run your own paid bar, make sure you're allowed to charge your guests for drinks as this might also be restricted. These are fairly uncommon examples of venue policies but they are all stories I've heard from real brides, so it's better to be prepared than to have your plans scuppered! Now that all the boring stuff about contracts and fine print is out of the way, let’s talk about suppliers. It’s not uncommon for venues to have preferred or recommended supplier lists. These can often be a godsend when you have no idea where to start looking for flowers, catering and cakes, and working with people who know your venue and all its quirks and foibles is also a big benefit. BUT while you might love the look of the venue’s supplier list, can you afford them - or worse yet, do you even like them at all? Before committing to a venue with preferred suppliers, make sure you have a chat and get full quotes and references from all of them before deciding. Why get stuck with a 3 course sit-down meal you can’t afford because that’s all their caterers do, when you really wanted a BBQ-style buffet? If, on the other hand, you're free to hire your own choice of suppliers, ask the venue if they require a specific level of insurance. Again, this is something that might only be mentioned in the final contract and you don't want to lose out when you realise last minute that you can't use someone you've booked because they don't have the right coverage! While the day is of course all about you and your beloved, it’s only polite to take into consideration all the other people you love (or like) enough to have invited by making sure they can get to your chosen venue easily enough and find somewhere comfy and affordable to stay afterwards. You don't want all your guests feeling miserable after a nightmare journey and extortionate hotel bill! So whether it’s just a few out-of-town relatives or the entire guest list (if you’re getting married abroad) make sure there are reasonable transport links and enough hotels or bed & breakfasts nearby to accommodate everyone. Your venue should be able to provide a list of recommended places and local taxi companies, and websites like Booking.com and Airbnb are also brilliant. 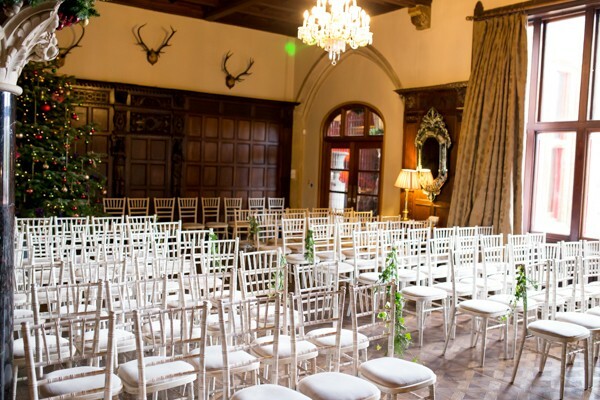 We got in touch with all the places Huntsham Court recommended for their availability and rates and sent all their details, including website links and distance from the venue, to our guests to sort out themselves. Some hotels and B&Bs will also let you provisionally reserve blocks of rooms at preferential rates for wedding guests, which is even better! Top tip: Find out if there are any big events nearby, such as festivals or concerts, at the same time as your wedding. If so, you’ll need to remind your guests to get their transport and accommodation sorted ASAP to avoid the rush. Now, no matter how proactive, organised and helpful you are, you will inevitably have the odd guest who hasn’t read your emails or wedding website, and leaves everything until the last minute. So if you get panicked calls a week before the wedding from someone saying everywhere is fully booked or the train tickets cost a bomb, just remember: THIS IS NOT YOUR PROBLEM. This might sound obvious, and therefore unnecessary to include, but the feeling you get from the venue’s team when enquiring and looking around can speak volumes. How quickly do they respond to your enquiries? Are they friendly and accommodating? How many weddings do they have a year? You need to make sure you feel comfortable around them and don't have any doubts about the service you'll receive not just on the day, but in the run up to it. There will be so many little things you won't event realise you have to think about, and having helpful venue staff and a co-ordinator who not only really cares but is also so organised they would be Anna Wintour's dream assistant will make the world of difference. If you find it hard to get hold of them from the beginning, or a sense that they can be unreliable, dismissive or rude, for example, then that should raise alarm bells! We came across so many lovely and friendly people throughout the planning process, so the few that weren't really stood out and it was very easy to say 'no thanks!' to them. You're going to have enough drama with bridesmaids and in-laws, you don't need to deal with a bad attitude from your venue too! Phew! Apart from all that, just enjoy it. Visit places you’d never imagine for your wedding. You never know what you’ll like until you’re there picturing those perfect moments, and something different might surprise you! And once you've done all of this, make sure you get everything that's been mentioned or verbally agreed on IN WRITING before you sign or pay anything. It's not very fun or romantic, but think of it as extra wedding insurance - just in case ;)"